Robin Hood’s Well near Helmshore, Lancashire. OS Grid Reference: SD 77860 19544. 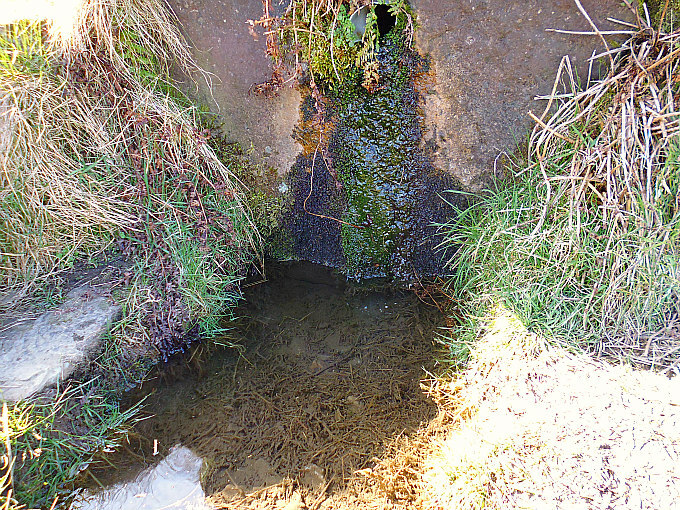 At the north-eastern edge of Holcombe Moor and beside Moor Road, locally called Stake Lane, 1 mile south of Helmshore, Lancashire, is Robin Hood’s Well/Spring. The well is located at the side of the old pilgrim’s route that led to Whalley Abbey and which passes close to the medieval Pilgrim’s Cross, that is now nothing more than a stone-base on the moor. There are no records to say that Robin Hood’s Well ever had healing powers, or to it being a sacred spring, but it must have had some holiness attributed to it by the monks and pilgrims who visited it and drank of its waters back in the mists of time. And there is nothing that says Robin Hood the outlaw of Sherwood Forest ever visited the well, though there is a Robin Hood’s Inn down in Helmshore village. It may originally have been called Pilgrim’s Well. To reach it walk south along Moor Lane for 1 mile from the village of Helmshore, or go up the footpath from the B6214 (Helmshore Road) near Pleasant View Farm. Follow the path across the farm track and up over the fields over the wall stiles to the rough track (Stake Lane) at the top. Go through the wooden gate on the right and the well is below the wall in front of you. Close-up of the pool below the spring. “After the move made by the Cistercian monks of Stanlow to Whalley at the end of the thirteenth century, traffic would have increased along this route. 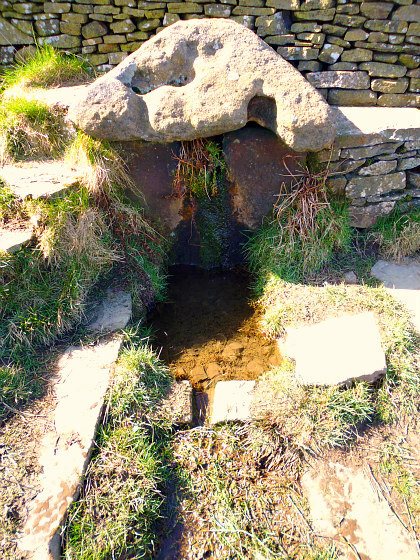 About one mile to the north of Pilgrim’s Cross, near this pilgrimage route is Robin Hood’s Well. 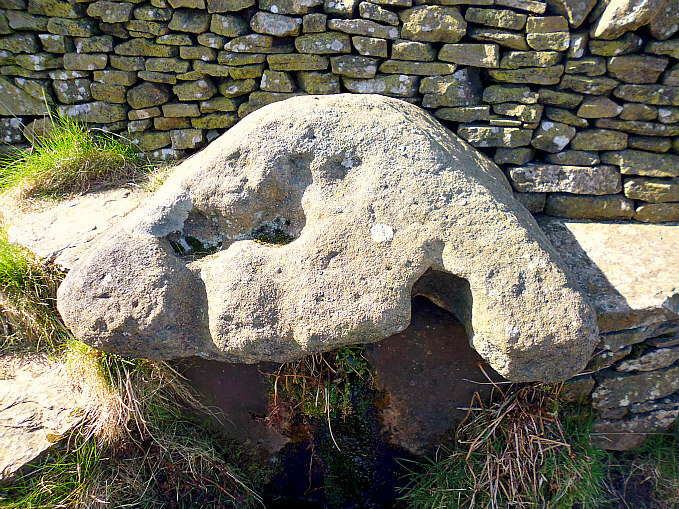 Pyramid-shaped stone above the well/spring. Mr Crawshaw goes on to say that: “Though it is reasonable to assume that this well was used by pilgrims on their way to Whalley church and later, the great Cistercian abbey there. I have not been able to discover any recorded references to its original dedication: nor does there seem to be any written record reciting any healing properties attributed to the water. It is possible of course that any such references are lost or were never recorded, or perhaps the well’s reputation in the middle-ages was merely that of a providential source of drinking water on a pilgrim’s route, where prayers were said in gratitude for the slaking of the pilgrim’s thirst. “I have a theory that in fact the name of the well may have been brought into use following the 16th century religious reformation. I understand the term , “the play of Robin Hood” was used by the 16th century Lancastrian religious reformers as a derogatory nick-name to describe the rituals and ceremonies of the old English Catholic Church. These reformers had no use for pilgrimages to holy sites such as the ancient parish churches, the shrines of saints or holy wells; indeed they denounced them as being of no spiritual value. “One of the most famous Lancastrian reformers, John Bradford, in his Christmas sermon delivered in Manchester in 1552, threatened the people that, if the town did not “readily embrace the Word of God, the Mass would be said again in that church, and the play of Robin Hood acted there”, ¹ which did indeed come to pass during the reign of Queen Mary. I believe that this ancient spring derives its name from this time, when the practice of visiting such wells was being denounced as “superstitious”. Crawshaw, John, (Robin Hood’s Well), Source—The Holy Wells Journal, New Series No 6—Summer 1998, Pen-y-Bont, Bont Newydd, Cefn, St Asaph, Clwyd, 1998. ¹ Haigh, Christopher, Reformation and Resistance in Tudor Lancashire, 1975, Cambridge University Press, Ch.11, 168. 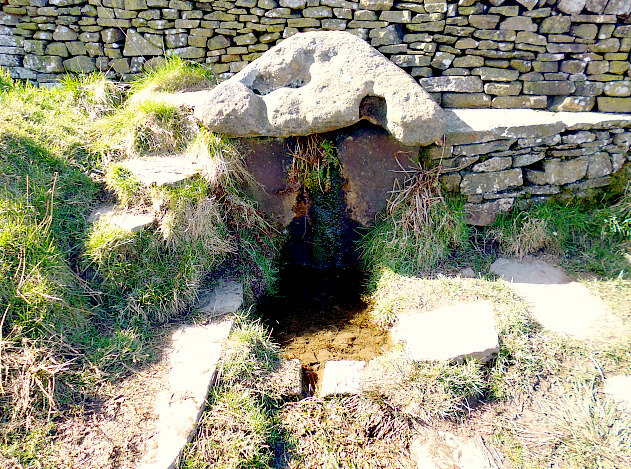 Categories: Holy Well, Holy Wells / Springs | Tags: Robin Hood's Well at Helmshore in Lancashire | Permalink.